I LOVE the website (CP Client Portal). This puts you head and shoulders above your competition. I have to say that the level of service you have provided us over the past two appeals has been just fantastic. Thanks. I've really enjoyed surfing thru the CP website. It's pretty awesome what you guys do. It was nice being able to track the status of our case and to get these job request portal confirmation emails. Excellent way to communicate. I am writing this note to you as thanks for a great job in a recent appeal you handled for my office . After a disappointing loss in front of the Hudson County Chancery Judge I retained Counsel Press to prepare the appeal. They were great. They literally took the matter out of my hands and prepared the appendix and the brief and met all the deadlines imposed by the Court. Their Brief writing was logical, concise and effective. 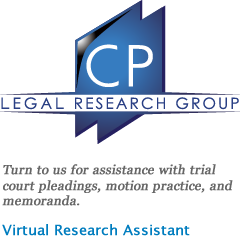 In fact it was so effective the Trial Court's decision was reversed and my client won. 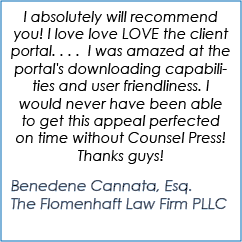 If you are an attorney reading this do not hesitate to use Counsel Press, they will take a big burden off your mind and will produce a final appellate brief , with Appendix, that will exceed all your expectations.